Academy Sports & Outdoors $10K Spring Team Trail Qualifier #3 this Saturday Mar.30th. ONLY 5 QUALIFIERS LEFT!!! The Academy Sports & Outdoors $10K Spring Team Trail Qualifier #3 this Saturday March 30th Shearon Harris!! 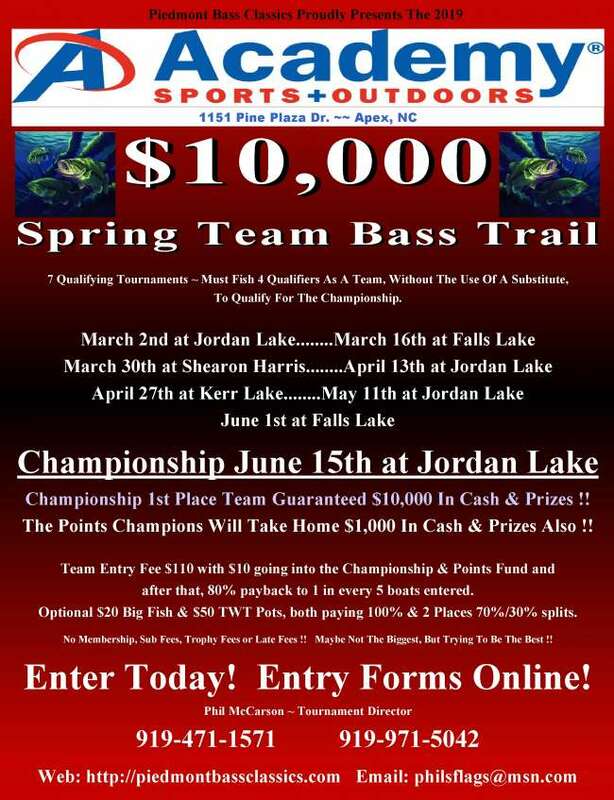 One qualified team will win $10,000 in the Championship at Jordan Lake June 15th!!! Come on and join in the fun!!! SHEARON HARRIS.....CROSSPOINT LANDING WILDLIFE RAMP. Blast Off At Approx. 7:00am ...1st Flight Weighin 3:00pm. Enter Today For Best Starting Positions! No late fees or membership fees. Remember, this is also an open event for anyone wanting to fish and not interested in the Championship. We invite you to join in the fun!! I will be at the ramp at 5:00am taking entries & checking in pre-entries. Entry fee is $110 per team with $10 going into the Championship Fund, $80 paid back with 1 place paid for every 5 teams entered. $20 goes to tournament expenses. Optional Big Fish Pot $20 & TWT $50 (both paying 100% back with 2 places each). Cash only at the ramp. I invite all of you and your angling buddies to fish with us!